The Cooper Bussmann Point-to-Point Short-Circuit Calculator is a simple, easy-to-use program that allows you to calculate prospective short-circuit currents with a reasonable degree of accuracy. These values can be calculated on the load side of a transformer, at the end of a run of cable or at the end of a busway. 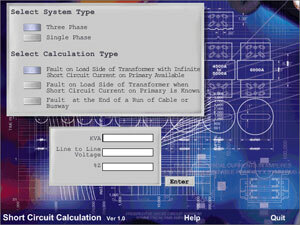 Calculations can be made for single or three phase systems. I need for busbar temperature rise calculation method and formula. Can anyone help me with getting the calculation for stainless steel tie-wrap short circuit withstand calculations. Sorry, but this tool does not work in Win7 or Win8 64bit. That’s the words of developer. Only thing you can try is to run it in WinXP compatible mode. This is my first time to register on this web site I think this would help me a lot and also to some professionals to acquire more technical information in the field electrical engineering. Thanks for the privilege. I unable to install this programm on my computer.. it is telling to check my computer’s system information to see whether you need an x86 (32 -bit) or x64 version of the program and then contact the software publisher.. Im getting this error for all the programs on this website..
Well, these software wasn’t developed by EEP, so we cannot help much with this. Some developers stopped updating their software, some not. I’m 100% sure that almost all software is 32bit, and therefore not 64bit. If you’re using Win7/8 64bit, make sure to use it in compatibility mode (right click on icon / properties / Compatibility / check box ‘Run this program in compatibility mode for’ / Windows XP SP3). I guess this is the only way to use old software in new OS like Win7 or Win8. If you have better approach to solve this problem, feel free to post here. i really feel so good to join EEE portal.thanks EEE. Hey Edward ……..please can you send me the softeare of short circuit explanation and calculation for bus bar.. Thanks a lot, can anybody tell me in which UNIT (ft or m) that we have to enter the circuit length for calculation..
Great Site to learn about Electrical Engineering!!!!! Doesn’t work with windows 7 64 bit any other non excel program available ? Thank you Mmoli! If you have any suggestions or remarks, please write it here! @Edvard, Thank you for the very informative website. Is it possible to output excel calculated values to an autocad drawing? Example, a circuit diagram in excel file that calculates voltage drop of each branch could it be possible to out this result including the diagram into acad drawing? if possible can I get some tips on how to make it?